Inclusiveness is an essential source of vitality and strength for the communities we serve. Diversity is the seeking and achievement of a broad representation of experiences, perspectives, opinions, and cultures within philanthropy. 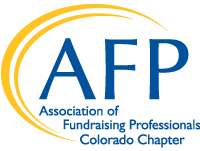 Assist fundraising professionals in advancing their work with diverse constituencies through education, training and development. Our Board, along with our VP of Diversity and Inclusion, Kathleen Casanova, are actively partnering with individuals and organizations throughout Denver to ensure our existing programming are inclusive and are actively identifying new partnerships to help bring in new programs and opportunities for members. If you are interested in partnering with AFPCC to help further our mission of diversity and inclusion, please contact Kathleen Casanova at kacasanova11@gmail.com. Traditions of giving, philanthropic motives of America's diverse ethnic and culture groups. Resources that will support your organization in staying the course with its inclusiveness work. This door provides opportunities to explore a comprehensive inclusiveness initiative, to consider a holistic rather than piece meal approach to the area of inclusiveness. We are proud to be a Friends of Diversity Chapter. Here is the list of other chapters with the distinction for 2019.